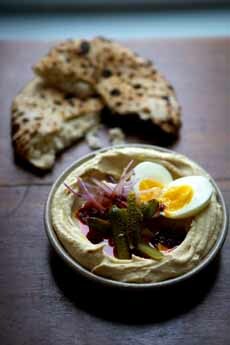 TIP OF THE DAY: National Hummus Day: Try A New Brand! 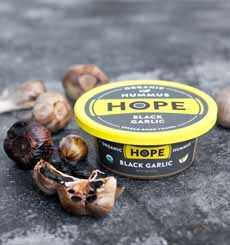 Black Garlic, one of 11 delicious flavors of Hope Hummus (photo courtesy Hope Foods). One of our favorite ways to serve hummus: topped with salad ingredients and, as a lunch dish, with a hard-boied egg (photo courtesy Shayla | NOLA). Woo hoo, chocolate hummus (photo courtesy Hope Foods). May 13th is International Hummus Day. 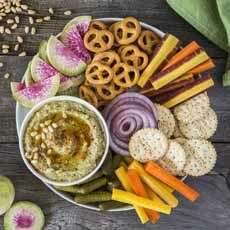 Over the last two decades, hummus has evolved from a mezze at Mediterranean restaurants to the hottest, most nutritious dip and spread at supermarkets nationwide. It’s the darling of nutritionists, nutritious and versatile, and a better-for-you snack. Hummus is Arabic for chickpea. The more long-form name for what we refer to as hummus is hummus bi tahina, chickpeas with tahini. Tahini is a paste made of toasted, hulled sesame seeds, which can been joyed as a dip on its own. The recipe for hummus is simple: chickpeas, tahini and seasonings (including garlic), mashed and puréed*. Two decades ago, the hummus available in the U.S. was the classic: plain. If you didn’t order it at a restaurant or live near a neighborhood with an international market that carried it, you made your own the recipe is easy, once you found a store with tahini). But since the hummus renaissance, stores have been sagging under the weight of so many brands and so many flavors. We’ve counted more than two dozen flavors among different brands. Our personal favorites: horseradish and black olive, which we found at Trader Joe’s. But, we like everything. So we were very pleased to receive samples of a new brand from Hope Foods. If you head to the website now, you can enter to win a year’s supply of hummus. There are 11 flavors of hummus. We tried three of them, all especially delicious. First, the consistency is wonderful, like well-mashed homemade hummus. While we enjoy the ultra-smooth texture of big brands like Tribe, we welcome the return of toothsome texture, like Grandma used to make (if your grandma’s ancestry was in the eastern Mediterranean). Second, the flavor selection is a bit more interesting, with black garlic, Thai coconut curry, and spicy avocado hummus (the most popular flavor). The line is preservative free, certified Gluten-Free, Non-GMO Certified, OU kosher and USDA Organic. There’s a store locator on the website. 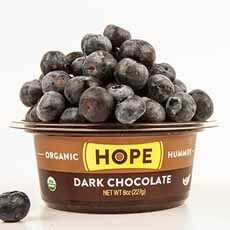 While we haven’t had Hope’s chocolate hummus, we have had other brands: Thumbs up! The company also makes guacamole, which we have not yet tried. *Some brands also add olive oil. Chickpeas, sesame, lemon, and garlic have been eaten in the Levant† for millennia. Though widely consumed, chickpeas were cooked in stews and other hot dishes. Puréed chickpeas eaten cold with tahini do not appear before the Abbasid period (750 to 1517 C.E.) in Egypt and the Levant. The earliest known recipes for a dish similar to hummus bi tahina appear in 13th-century cookbooks from Cairo. †The Levant is an English term that first appeared in 1497. It originally referred to the “Mediterranean lands east of Italy.” The historical area comprises modern-day Iraq, Israel, Jordan, Lebanon, Palestine and Syria. 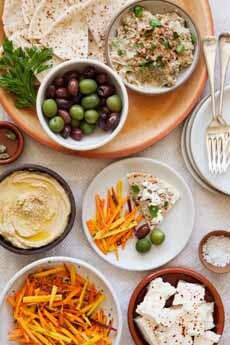 Among other popular foods, Levantine cuisine gave birth to baklava, balafel, kebabs, mezze (including tabbouleh, hummus and baba ghanoush), pita and za’atar, among other dishes that are enjoyed in the U.S. and around the world. Mezze (MEH-zay) or meze is the singular form for a number of small dishes served in the Middle East to accompany drinks (add an “s” for the plural form in English). In some countries, an assorted mezze plate is served as an appetizer. A mezze plate in California: babaganoush, feta, hummus, olives, pita and a local touch, pickled carrots (photo courtesy Good Eggs). Hummus itself is gluten-free, but not the pita. This gluten-free hummus plate from Glutino Foods offers other options. Babaghanoush, mashed eggplant mixed with seasonings. Dolmades can take many forms. In the U.S., they’re usually Greek-style: grape leaves stuffed with rice, chopped mint and lemon juice (these are also called sarma). In some countries, eggplants, peppers and zucchini are stuffed, often with the same ingredients plus minced lamb. Falafel, a deep-fried ball or patty made from ground chickpeas, fava beans, or both. Fattoush – salad made from several garden vegetables and toasted or fried pieces of pita bread. Feta cheese or other local cheese. Halloumi cheese, sliced and grilled. Hummus, a dip or spread made from cooked, mashed chickpeas. Kibbeh, a mixture of bulghur, minced onions, finely chopped meat, and spices. Depending on the region, it is shaped into balls or patties and fried, baked, cooked in broth, or served raw (tartare). Souvlaki, bite-sized lamb cubes, grilled on a skewer. Labneh, strained yogurt that is more tart, like sour cream. Tabbouleh, bulgur wheat, finely chopped parsley, mint, tomato, green onion, with lemon juice, olive oil and seasonings. Taramasalata, a carp roe dip based whipped with lemon juice and olive oil. Sometimes, mashed potatoes or bread are added to stretch the recipe. We buy the Krinos brand, which does not add fillers. Tzatziki, a dip made from plain yogurt, chopped cucumber with finely chopped garlic and mint leaf. They are typically served along with Greek-style olives and pita, or other flatbread.